Building pirate fave, a Bumbo cocktail, at SLS’s Cocktail Fundamentals cocktail class. Dunno why that guy on the right is wincing. After having taken two of Bar Centro lead bartender Rob Floyd‘s monthly “Cocktail Fundamentals” classes* at SLS Hotel’s SAAM, I’m convinced he’s the John Keating of cocktail schooling. For those who don’t remember that 1989 movie Dead Poets Society, John Keating, played brilliantly by Robin Williams, was the professor whose infectious love of poetry inspired his students to “Carpe Diem.” Unlike most cocktail classes that send you home with cocktail recipes and some experience with building a drink, Cocktail Fundamentals is more about the memories, albeit hazy, of a good time. 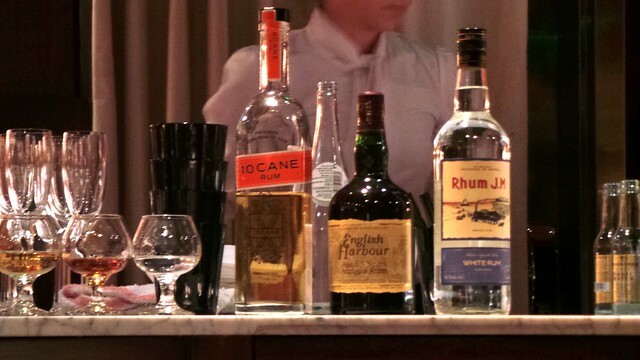 For instance, at this month’s “Pirate Juice and You” class, we didn’t really get schooled in how to make a cocktail, nor did we learn anything more in-depth than what you’d find on Wikipedia. And the most hands-on we got was grating lemon peel and nutmeg on a pre-batched cocktail. But who really cares? The lesson here, as in previous classes, is to enjoy the now…while boozing it up in a classroom setting aka the chef’s tasting room. Plus the class is only an hour long so keeping our rowdy lot of wanna-be buccaneers on track was especially key. 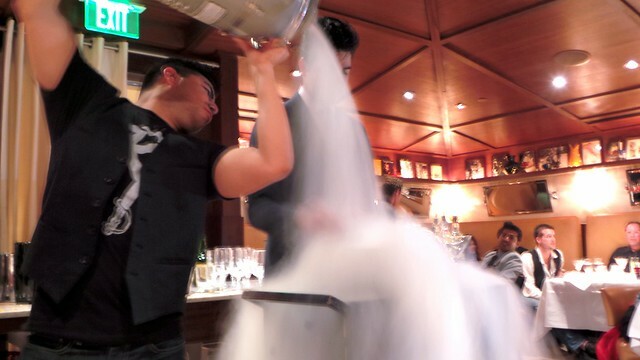 Rob told us provocative stories about lesbian pirates, employed a “pay attention” exercise where we had to yell out “ARRR!” every time someone mentioned “Pirate,” and of course busted out the good ol’ molecular mixology with liquid nitrogen (Oooh! Pretty!). Oh, if only my high school teachers were that captivating. And like breadcrumbs taking us through each lesson, Rob presented several rum cocktails including the Mojito, a blackberry rum liquid nitrogen-chilled cocktail and a blood orange rum concoction. All five classroom cocktails were tasting portions, however, so no one was in any real danger of getting wasted. Before we knew it, our hour was up and we were lead out to a long table in Bar Centro where we were given pirate-inspired T-shirts to take home and then instructed to grate lemon peel and nutmeg over a Bumbo cocktail, a rummy pirate concoction used back in the day to help stave off scurvy thanks to its use of citrus. Folks mingled a bit while others took advantage of the 25 percent discount the cocktail class students were given to use at the restaurant after the class. Even though the Cocktail Fundamentals class is $75, I highly recommend signing up with some friends. It’s perfect for those who want to take the whole “hanging out at a bar with your buddies” to the next level. Just make sure to RSVP asap since the classes held in this 40-person capacity room tend to book up quickly with wait lists 40 SOL people long. Currently there’s a 6pm and 8pm class held the first Sunday of every month but considering its growing popularity, here’s hoping they add a few more. Rob’s next class on April 7th sounds like it’s going to be a blast: 1920s theme where everyone has to dress up or else they’re not allowed entry. He wouldn’t give me a hint of what to expect but I’m thinking Jazz, Clara Bow lookalikes and classic cocktails. 1) Muddle the blackberries with the simple syrup and lime in cocktail tin. 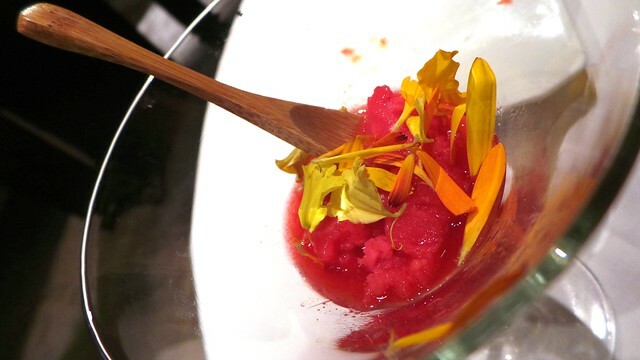 2) Add rest of ingredients and ice. Blackberry rum cocktail chilled via liquid nitrogen. Avant garde way to chill a cocktail. 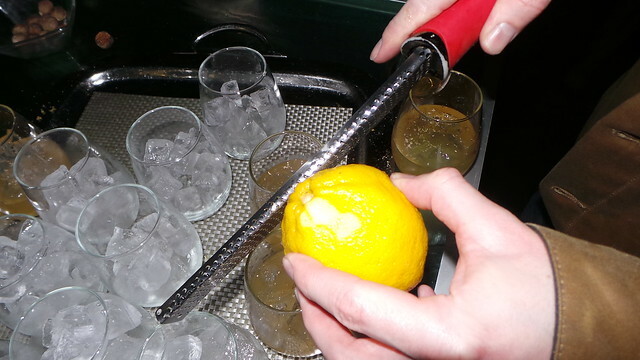 Grating lemon over a Bumbo cocktail. 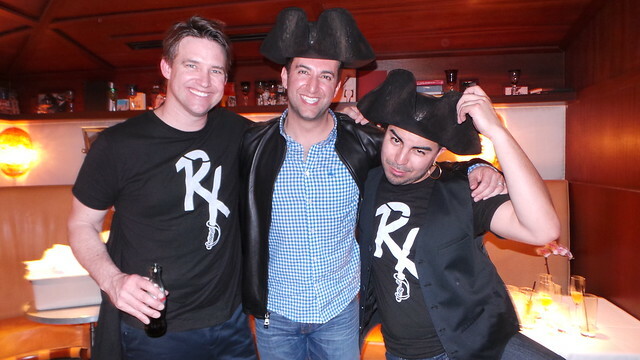 SBE’s Sam Bakhshandehpour stops by to visit Captain Rob Floyd and his pirate bartender. Ty for the link luv! That isn’t Sam Nazarian, it is Sam B from sbe. Oh geez, you’re right. My bad. Fixed it. Thanks!